All BLACKHAWK! stand-alone plates are certified in accordance with NIJ Standard 0101.04 and Standard 0101.05 Level IV protection requirements. Made of a proprietary ceramic material, BLACKHAWK! 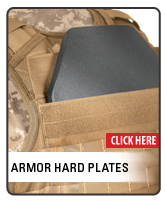 plates are designed to be worn alone or in conjunction with their NIJ Certified Level IIIA soft armor panels.